On March 27, 2018, the immigration officials of Nova Scotia have organized new draws in the Entrepreneur and Graduate Entrepreneur streams. In The Entrepreneur draw, 22 candidates have received Invitations to immigrate Apply in Nova Scotia. The score of the candidate having the lowest-rank was 108 points. In the previous draw also, which was held on February 20, 2018, 22 candidates have received Invitations to Apply. The score of the candidate having the lowest-rank was 100 points. Furthermore, seeing the figures, the highest number of invitations in a monthly draw was 36. The lowest minimum score for qualifying was 90. This Entrepreneur stream aims to attract candidates who have business ownership or rich experience in senior management. The norm here is that they must reside in the province. Moreover, they must start a fresh business or buy a business that is already running. They must participate enthusiastically in the daily management of this business. In the Entrepreneur stream, applicants get a Canada temporary work permit before they apply to get permanent residence. They must run the business for one year. There is an Expression of Interest format, and the candidates existing in the pool get an invitation for applying. They should have an at least 3 years of experience in dynamically managing a business or own a business and have 33 percent stake in it. Meanwhile, there was a draw for the International Graduates also on March 27, 2018. Only one candidate has received an Invitation to Apply after he had scored 67 points. This is the seventh draw of the stream, and 10 candidates have been invited to submit an application till this date. Furthermore, this International Graduate Entrepreneur stream has similarities to the Entrepreneur stream. 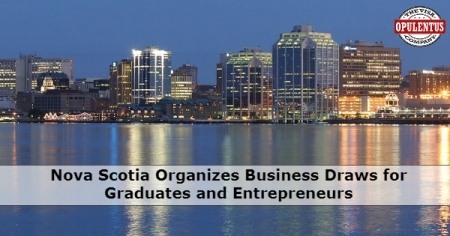 It aims to attract graduates passing out after studying in a university or a Community College in Nova Scotia recently. They norm is starting or purchasing a business and running it for one year in Nova Scotia after getting a Post-Graduation Work Permit. The Candidates who wish to settle in the province get a nomination for permanent residence. This stream runs in a format of Expression of Interest which is similar to the Entrepreneur stream. Expressing Interest, getting an Invitation to Apply, after which an Interview is conducted. Then they can Request for Nomination and also apply for Permanent Residence. Moreover, a one year of experience in dynamically managing a business or own a business and have 100 percent stake in it.